It's important to remember that all Champagne is sparkling wine, but not all sparkling wine is Champagne. True Champagne blends three grapes―Chardonnay (white), Pinot Noir (red), and Pinot Meunier (red)―from the Champagne region of northern France (about a 1 1⁄2-hour drive northeast of Paris). However, sparkling wine is made all over the world―from the United States to Italy to Spain (and practically everywhere in between). As a general rule, méthode champenoise ("Champagne method") is the phrase you're looking for on the sparkling wine's label. This tells you, among other things, the wine has undergone a second fermentation in the bottle, producing millions of tiny bubbles. Spain's easy drinking Cava (KAH-vah) is made in the Champagne method and just might be one of the best values around (often found for less than $12). The most notable Italian sparkler, Prosecco (praw-SEHK-koh), is a fun-loving wine with loads of fruitiness, a touch of sweetness, and soft bubbles. It's the base of the Bellini, the famous white peach refresher invented in the 1930s at Harry's Bar in Venice. Sparkling wine should be well chilled―30 minutes in ice water or 3 hours in the refrigerator should do the trick―and served in slender, flute-shaped glasses. Before you can pour it, though, you have to get the bottle open. Despite what you see in the movies, the proper way to open sparkling wine does not involve firing the cork across the room with a loud pop. Rather, in a controlled fashion, let the pressure of the bottle gently release the cork with an ever-so-slight hiss. • Loosen, but don't remove, the cage, keeping your thumb over the top at all times. • Hold the bottle at a 45° angle. 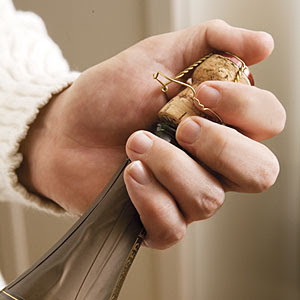 With your thumb over the cork, slowly twist the bottle (not the cork) in one direction while holding the cork firmly. • Allow the pressure inside the bottle to gently push out the cork.